Help-where can I find a copy of of original instructions for various transformers? I have an LW, a TW, and a ZW. I'm putting together a Lionel layout per book by Stanley Trzoniec. He uses an RS-1 transformer. I'm using the LW. I have the track blocked okay but I'm having trouble hooking up accessories through barrier strip and Atlas 205 connector. You could purchase Greenberg's book on Lionel Postwar operating instructions. But as luck would have it, I have the original instructions right here in front of me. Since you're using an LW transformer, we'll start with that. First, as you've probably discovered, the handle should be all the way to the left to turn off variable power (although it instinctively feels wrong). Also, where most transformers would have the A terminal as the power source and U as ground, the LW is backwards again. The U terminal is power and the A terminal is ground. The instructions suggest that 'U' is connected to the center rail, 'A' is connected to the outer rail, B is connected to automatic switches auxiliary inputs, and 'A' and 'C' are used for accessories, 'A' still being used for ground. TW transformers also use the 'A' terminal for ground. On the back of the transformer the various posts identify which combinations of terminal posts provided a certain amount of fixed voltage. For instance, terminal posts 'E' and 'F' provide 14 volts of fixed power. The ZW does not have fixed voltage outputs. Although the ZW can operate four individual trains, most operators prefer to use terminal posts 'A' and 'U' for one train and 'D' and 'U' for another. Posts 'B' and 'C' would then be assigned for automatic switches and accessories and the right output adjustments can be made for optimum product performance. I recently got some very old Lionel trains from my father that where his when he was a child. I am looking for some kind of display case for the trains to kept them protected and safe. I can't seem to find anything out there, was wondering if you knew of any. There are a lot of different things you can do, depending on how much you have. Railrax is a popular way to display your trains. We use them in our studio. They are long aluminum shelves that mount to the wall and the trains are placed on the imbedded rails length-wise. I have also seen Plexiglas shelves designed to hold several trains. There are wood versions out there as well. Search the Internet. Look on eBay. Check your local hobby store. I think in your comparison of the two Dreyfuss Hudsons, you should mention that the MTH is scaled wrong. It is a good foot or more wider than scale width. Hey... beautiful job on the page comparing the valve gear motion of the three Hudsons. I seldom see comments about any sort of technical details in toy train product reviews... let alone animated GIFs to illustrate! A definite high-water-mark for the genre... the sound clips were much appreciated, too. Would love to see more of this sort of technical commentary in the future. How about a comparison of Atlantics next? A few years ago hallmark sold Lionel trains in a case sitting on top of wood. Would you know what the track scale would be on those? I think I know which models you're writing about (there have been at least two or three different sizes of these Hallmark models over the years). I've never heard of the ones sitting on wood blocks being identified by any scale. They look pretty close to S gauge, which is 3/16" to the foot. There are smaller versions sitting on what looks like Gargraves track that are widely considered OO. I have a box car marked X6454 Southern Pacific, made in 3-42. All the information that I can find says it was made in 1949 to 1952. What does the 'X' mean? With all the data markings and various numbers on the sides of the cars, the 'X' prefix identifies 6454 as being the Lionel item number. It catches the eye. The X was not used an all cars, but a lot of them were in both the Prewar and Postwar years. In a few cases, the X is on some cars of a certain roadname, but not on others. This is known as a variation. Variations on the same model of a car can often cause differences in value, depending on which variation is less common. I don't have the adaptor pins to connect to Lionel Track to the Super "O" Track. Where can I get the adaptor pins? And also do you know how I can pull out the adaptor pins out of the Super "O" Track like the ones I already have so I can make a track with an 'S' curve? And are these Super "O" tracks the kind I have Black Ties & Silver Rails? Cause you see, I'm just an 11 year old kid. I'm just starting on Lionel. If you are referring to the pins to connect Super O track together, extras are not easy to come by. I've never tried this but perhaps the pins used for Gargraves track would work. Pulling pins out of Super O track is tough. If you look at the rails where the pins are stuck in you may notice that the track is crimped down on the end of the rail to help keep the pin in place. You need a lot of elbow grease to pull it out. Use a big pair of pliers and try to work it out of there. I recently purchased the RailKing version of a locomotive, which I believe was manufactured in 1996, but without the operating instructions. I've contacted both MTH and QSI for instructions but each sent me to the other. Without the instructions I can't get the engine to operate (it does light up, and occasionally a bell rings, but it won't run). Can you offer any assistance on where I can get the needed info? I just got back into the O gauge hobby after 45 years and this is a very disappointing situation. You'd think that either MTH or QSI would have this info in their archives. The ProtoSounds 1 locomotives sometimes require a certain touch to get the hang of. They all pretty much operate the same way. Power up, you should hear two dings of a bell followed by the start-up sounds of the locomotive. I recommend using a direction button instead of working the throttle to move the train or change directions. If, after pressing the direction button, the locomotive still sits there and you hear two dings again, decrease power a bit and try again. If the locomotive makes a slight forward move, increase power and you should start moving. On an older transformer, when the locomotive is moving, pressing the whistle button will blow the horn. If it is in neutral, pressing the whistle button will ring the bell. Coupler: with the throttle up to about 15 volts, pressing the whistle button should "prime" the coupler. You'll hear a "clink" sound. Pressing the whistle button again should open the coupler. Extra sounds: After the locomotive has been moving, tap the direction button so the loco stops and is in neutral. 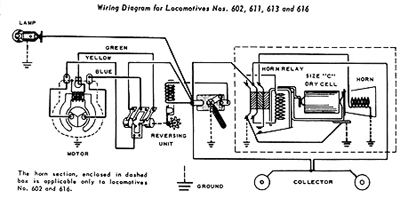 The directions of the locomotive cycle through neutral, forward, neutral, reverse. Throttle the power down to about 8 volts. Hold in the whistle button. The bell rings, and after about three seconds you'll hear a "whoosh" as if the brake line is releasing air build-up. Let go of the whistle button, and tap the button again to turn the bell off. Now hit the direction button so the locomotive moves forward. Now tap the direction button so the locomotive stops. After a couple of seconds you should hear talking. Hit the direction button again. The chatter should change a bit. Now hit is again and there should be another change in talking. Finally, hit it one more time: the locomotive should blow the horn and start moving. I hope these directions are not too complicated. If you follow them to the letter, you should have no problems. Again, sometimes you have to develop the right touch on the throttle to get the desired effects. I read about a Circus Train made by Unique. In the late 1940's, Unique Art introduced "O" Gauge lithographed trains in competition with Marx trains. Marx took that challenge seriously and offered a series of 7" cars in 1949. Louis Marx and Sammy Bergman had been close friends for years. Sammy directed Unique Art, a toy manufacturer in New Jersey. They sold each other's trains and toys and even exchanged tools and dies for toy parts. Imagine Marx's surprise when, in 1949, Unique Art introduced its own line of "O" Gauge lithographed trains in direct competition with Marx! Marx immediately began developing a line of 7" cars to be marketed for the 1949 Christmas season. As it turned out, Unique Art trains suffered an early demise, so a Circus Set is a collectors' item. Unique's toy typewriter proved to be a more serious competitor, which Marx vanquished by having his typewriters produced less expensively in the Orient. The reason that you didn't recognize this Circus Train is that it occupied the "low-end" portion of the toy train market, and it didn't last long. Generally, Unique Art trains are bigger than Marx trains, though they run on the same "O" and "O-27" track. Unique Art trains turn up occasionally in the "Who Done It?" series by John S. Newbraugh in the TCA Quarterly. Now and then I see them at York, but nobody gets excited about them. Another source is Greenberg's Guide to Marx Trains. Unique Art trains are described in reference to Marx 7" cars. The TCA Library by the TCA Museum and Business Office at Strasburg may also have an article or two. You won't find much, because Unique Art trains were so few and so short-lived. That Circus Set may be the only set ever produced. Unique Art trains I have seen look like Marx trains, but a bit larger. As I said, they turn up at York now and then but nobody cares. Hi! I read Richard O. Smith's letter about his MTH reproduction Ives Circus Set locomotive slipping when trying to pull the train. Your suggestion about cleaning the track is a good one. I have another. He could make his train easier to pull by putting a drop of oil or a dab of lubricant between each wheel on the tender and cars and the sideframe of its truck, then turning the wheel to work the oil or lubricant between the wheel and axle. That will reduce friction and make the train easier to pull. I assume MTH uses wheels that turn on their axles, as Ives and Lionel did. When we run pre-1970 cars on the Richland Library layout, I always put a drop of oil between the wheel and truck side-frame, then turn the wheel until it turns freely. Last week a crowd was waiting for us to open, so we had to run trains right away. During a lull I oiled each wheel and axle. Electricity required to pull the train dropped by one volt. Now and then a car with post-1970 needlepoint axle bearings and fast angle wheels seems a bit reluctant to roll. A bit of oil or lubricant frees them up, too. The most recent example is an MTH Railking Reading caboose (30-7017F). I prefer Lubit 8, a terrific oil made by Tufoil. Mr. Smith may prefer a similar grease ("lubricant") because it stays in place. Either will work. USE ONLY A DROP OR A DAB, just enough to make a wheel turn freely WITHOUT excess oil or grease seeping out onto the surface of the wheel, getting on the track and accumulating dirt. TM, not to fear: the MTH IVES repro is so different that no one could mistake it for an original. There are no journal boxes on the repro cars, there are regular couplers not snake-track pull couplers, the performers car is not a brass-plate car. There are so many differences that you can spot the repro at a hundred paces. The cars are supposed to be 1928, but the engine is a copy of a 1930 #1134. The #1134 can be identified as a repro without touching it by the extra holes in the pilot deck and the front motor mount screws don't go down thru the running boards, they go up. It is a great operator, though. My son and I would like to begin building a train set in our basement. I have never done this before. Any suggestions on how to start, type of trains to buy, etc. Any web sites that look at each type and the pros and cons of each. Traditionally, new layouts for beginners are on 4' X 8' tables made of plywood and 2' X 4's. We offer a video on how to do this from start to finish, and there are many very informative books on the subject as well, including this one. I am looking for a master index that would help me associate and identify my trains. I am picturing a site where I could put in the Lionel number and get a picture and description of the item. Some descriptions on eBay are not enough and I am unfamiliar with things by name/origin. I'm am not sure of any thorough on-line index. However, there are quite a few fan sites out there that have a lot of pictures and descriptions. For a complete list with pictures and descriptions, you should look into getting some books. We have done a few in the past, but they are out of print now. You can still find them on, you guessed it, eBay. Ask your local hobby shop for ideas as well. Hi, I have a Santa Fe 616 Diesel Switcher which isn't working (somebody re-did the wiring) Is there any where that I might be able to find the schematics on this puppy? I would really LOVE to get it going . I recently saw a nice reproduction by American Flyer called the Commander at the George Bush Museum in College Station Texas. Is this commemorative issue still available to buy anywhere? Eric, my friend, this train is about as rare and expensive as they come. Originals made before World War II are worth more than a year's federal income tax cut for the top 1% earners in the United States. The re-productions made over the years (like the one you saw) are also worth thousands of dollars. The train you saw was made in 1992 and presented to the president by Richard Kughn, who owned Lionel Trains, Inc. from 1986 to 1995. The meeting took place aboard the president's whistle stop campaign train via CSX between Michigan and Ohio. I am looking for info on Lionel's Chicago & Alton Limited Set. Do you have a book that would show Details or Photo's of this set. I need to research this before I make a costly purchase. Thank you for any help you may be able to render. The Chicago & Alton set was, at the time of its release, among the top quality pieces made by Lionel in 1981. The small Hudson set included what are today known as "Baby Madison" cars. Those cars had diecast 6-wheel trucks, which are better than the 4-wheel plastic versions. The engine had smoke, Magne-Traction and the Mighty Sound-of-Steam. Certainly handsome, but by today's standards it is not as desirable as it once was. All-in-all, in mint condition the locomotive, tender, and five original cars are worth around $600.00.